Research Experiences in Solid Earth Science (RESESS) celebrated five years of research, mentoring, and community on August 6, 2009. We acknowledged the 2009 RESESS participants’ achievements during a morning colloquium and afternoon poster session together with students participating in Significant Opportunities in Atmospheric Research and Science (SOARS). Science mentors, program collaborators, and funders were also acknowledged. RESESS looks forward to another 5 years of supporting diversity together with Incorporated Research Institutions for Seismology, the United States Geological Survey, National Science Foundation, and other partners. The rise of atmospheric oxygen on ancient Earth is known as the Great Oxidation Event (GOE), and based on numerous lines of evidence this event is considered to have occurred because of biological activity between 2.4-2.5Ga. Although the GOE has been heavily investigated, we propose that by analyzing trace metals in sulfide minerals from banded-iron formations (BIF) we can discover trends in trace metal abundance before and after the GOE and further understand past conditions of early Earth. The mechanisms responsible for the widespread and voluminous mid-Cenozoic magmatism that occurred in the western interior of North America remain enigmatic, with previous workers having invoked processes ranging from subduction of oceanic lithosphere at the continental margin to internal plate deformation. These hypotheses are re-assessed here through an investigation of patterns in the ages, locations and compositions of Cenozoic magmatism in the western United States and northern Mexico evident from igneous rock data compiled in the on-line North American Volcanic and Intrusive Rock database (NAVDAT). The Gamburtsev Subglacial Mountains (GSM), posited as a nucleation point for Cenozoic glaciation, are an enigmatic geological black box; located in East Antarctica, they are completely covered by ice, have poor age constraints, and are surprisingly large and steep for a range of its location and age. Recently extracted shear wave splitting parameters from a passive seismic experiment above the GSM will, in conjunction with other geophysical studies, help constrain the lithospheric structure and evolution of this important geologic terrain. Gully erosion is a geomorphological process that is not completely understood by geologists due to insufficient data. 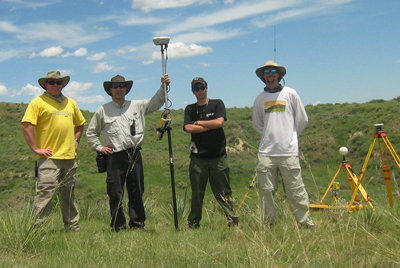 We use various techniques including 3D laser scanning (terrestrial and airborne), real time kinematic-GPS and aerial photography to acquire new data from a study site at Bijou Creek, Colorado, to help improve our understanding of how this process behaves. RESESS brings undergraduate science, math, and engineering students together with scientific mentors to participate in research over 4 summers. As students in the program transition from undergraduate to graduate school they experience real research alongside accomplished scientist around the country and the world. Eleven students have participated in the program over the past five years. For more information please visit the RESESS Web site. Figure 1 - 2009 RESESS Intern Fernando Martinez-Torrez researched gully erosion in Bijou Creek using Terrestrial Laser Scanning and GPS along with (from left to right) David Phillips and Brennan O'Neill of UNAVCO, and Greg Tucker of the University of Colorado at Boulder. Figure 2 - RESESS and SOARS (Significant Opportunities in Atmospheric Research and Science) students participated in leadership training at the beginning of the summer. Teambuilding activities during the training allowed the students to develop key skills they would need to utilize throughout their summer research experiences.